The meniscus is a small, "c" shaped piece of cartilage in the knee. Each knee consists of two menisci, medial meniscus on the inner aspect of the knee and the lateral meniscus on the outer aspect of the knee. The medial and lateral meniscus act as cushion between the thighbone (femur) and shinbone (tibia). The meniscus has no direct blood supply and for that reason, when there is an injury to the meniscus, healing cannot take place. 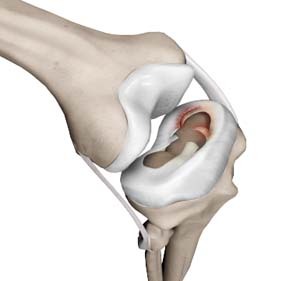 The meniscus acts like a “shock absorber” in the knee joint.